August 17, 2015 LATEST NIELSEN RATINGS TALLY PROVES BIG BONANZA FOR DISNEY'S "DESCENDANTS" The television premiere of Disney's "Descendants" was seen by 12.2 million Total Viewers according to Nielsen's comprehensive Live +7 data released today, ascending it to the #5 cable television movie of all time and nearly doubling its Live + Same Day delivery. The newest viewing data also confirms that "Descendants" more than doubled its delivery among Kids 2-11 (+108% – 6.184 million vs. 2.970 million) and Kids 6-11 (+102% – 4.920 million vs. 2.432 million) -- and nearly doubled its delivery among Tweens 9-14 (+90% – 4.353 million vs. 2.290 million), catapulting it to the #6 cable TV telecast on record among those three youth demographics. 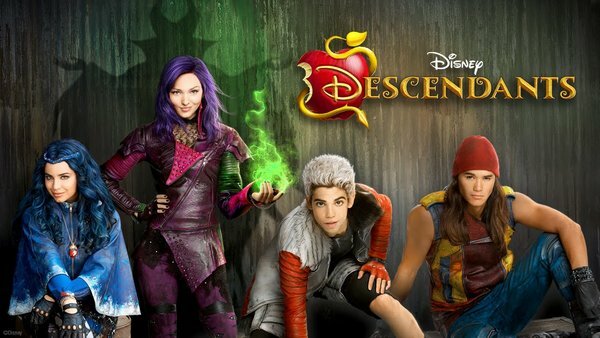 To-date on linear television alone, "Descendants" has reached 18.2 million unique Total Viewers with four telecasts. It will next be presented Tuesday, August 18 (8:00 p.m., ET/PT) on Disney Channel. On the WATCH Disney Channel app, "Descendants" has posted 2.5 million video views since July 24. It has begun rolling out on Disney Channels in 162 countries/territories around the world. It brings Disney Channel the historical record of six of the Top 7 original cable movies ever ("High School Musical 2," "Teen Beach Movie," "Wizards of Waverly Place: The Movie," "Descendants," "Phineas and Ferb the Movie: Across the 2nd Dimension" and "Camp Rock"). Continuing Disney Channel's history of significant parent co-viewing, "Descendants" was the #1 cable TV movie in nearly three years among Adults 18-49 (3.058 million/2.4 rating) – since Lifetime's "Steel Magnolias" remake on October 7, 2012 (3.428 million/2.8 rating). Directed, choreographed and executive-produced by Kenny Ortega ("High School Musical"), "Descendants" was written by Josann McGibbon and Sara Parriott. Wendy Japhet is also an executive producer, and Paul Becker is co-choreographer. Mark Hofeling is the production designer and Kara Saun is the costume designer. In North America, the movie is also now available on DVD at retailers and on iTunes, Amazon and Google Play. It's been #1 on iTunes (Top TV seasons) since August 1. In its second week, the "Descendants" soundtrack is #8 on Billboard 200 after entering the chart at #1 last week. It's also #1 on the Billboard Soundtrack chart, #1 on the iTunes soundtrack chart and #4 on the iTunes album chart. Six music videos of its musical numbers have delivered over 49 million views on DisneyMusicVevo. A music video of its end-credit song "Believe" by Shawn Mendes brings the tally to over 52 million. The movie has inspired creative fan art, fan fiction, fan song covers and fan dance videos. The next component is an animated short-form series, "Descendants Wicked World," set in the Auradon and Isle of the Lost worlds, premiering Friday, September 18 on Disney Channel and Disney online platforms. It is executive-produced by Jennifer Magee-Cook (producer, "The Pirate Fairy") and Aliki Theofilopoulos Grafft ("Phineas and Ferb," "Mickey Mouse" shorts). Grafft also serves as director on the series. It was written by Julia Miranda ("Lab Rats"). The prequel novel, "The Isle of the Lost: A Descendants Novel" by Melissa de la Cruz maintains its stronghold at #1 on the New York Times Best Seller List (Children's Middle Grade) for 12 of its 14 weeks. Three "Descendants" books from Disney Publishing Worldwide are now on that list with "Mal's Spell Book" by Tina McLeef debuting at #3 and "Descendants Adapted" by Rico Green at #4. Disney Consumer Product's retailers include Wal-Mart, Target, Toys R Us, Kohl's, JCPenney, Amazon and Disney Store. The licensed line includes fashion dolls, apparel, accessories, role play/costumes, bedding, DIY beauty products and consumer electronics. Licensees are Hasbro, Jaya, Mad Engine, Innovative Designs, Markwins, KIDdesigns, among others. Disney's "Descendants," a modern-day coming-of-age adventure about the teenage sons and daughters of Disney's most infamous villains, is a live-action, music-filled, dragon-sized adventure starring Dove Cameron (Disney Channel's "Liv and Maddie"), Cameron Boyce (Disney XD's "Gamer's Guide to Pretty Much Everything," Disney Channel's "Jessie") as Carlos, Booboo Stewart as Jay, Sofia Carson as Evie, Mitchell Hope as Ben, Tony Award-winning Kristin Chenoweth as Maleficent, Wendy Raquel Robinson as Cruella de Vil, Maz Jobrani as Jafar, Kathy Najimy as the Evil Queen, Melanie Paxson as Fairy Godmother, Brenna D'Amico as Jane, Sarah Jeffery as Audrey, Zachary Gibson as Doug, Jedidiah Goodacre as Chad Charming, and Dianne Doan as Lonnie.